As the average age of the population increases, cardiac disease predominates. The elderly population are vulnerable to most forms of heart disease, especially coronary artery disease, hypertension, arrhythmias and degenerative pathologies. Diagnosis of mild forms of heart disease may be difficult in the elderly. The wear and tear of age results in some features that would be regarded as abnormal in the young. For example, a fourth heart sound and a systolic aortic ejection murmur are common findings on examining normal elderly adults. 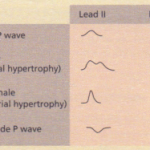 The ECG often shows slight PR interval prolongation (to 0.22 s), left axis deviation and T wave flattening. On the chest X-ray there may be some aortic, valvular or coronary arterial calcification, but the cardiac silhouette is usually normal. 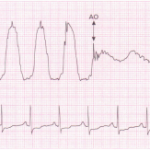 The echo cardiogram may show mild myocardial hypertrophy and buckling of the ventricular septum. 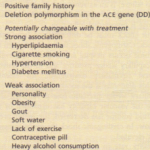 It is particularly difficult to diagnose and define hypertension in the elderly. Cuff blood pressure usually overestimates intravascular pressure if the old arterial wall is stiff (pseudohypertension). Normally blood pressure steadily increases with age, at least up to the age of 70 years, and blood pressure is particularly labile in the elderly. In the very old (>80 years) there is only a weak association between ‘hypertension’ and diseases such as stroke, myocardial infarction and heart failure. Cardiac disease may present in unexpected ways in an old person. It is not unusual for significant bradycardia to present as a fractured hip because the fall that caused the fracture resulted from transient asystole. 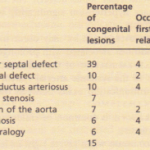 Left heart failure may present as an acute confusional state due to poor cerebral perfusion, rather than with the classical symptom of breathlessness. Myocardial infarction may not cause any chest pain (‘silent’ myocardial infarction) but may present as weakness or abdominal pain. The principles of treatment of heart disease in old people are usually no different from those governing treatment in the young. However, it is important to remember that drug pharmacokinetics are changed in the elderly: absorption is reduced, renal and hepatic clearance are delayed, body fat increases and lean body mass decreases. Old people may forget to take their medications or be confused about the correct dose. Some therapies seem inappropriate or futile in the elderly. For example, it is probably unnecessary to inflict a spartan life-style or rigorous uncomfortable drug therapy on an old person in an attempt to modify the risk of developing coronary disease. However, there are treatments that have emerged in recent years that are extremely useful for old people, for example, hypertension should be treated (see p. 621). Coronary angioplasty, and perhaps mitral/aortic valvuloplasty, can be undertaken in patients too frail to consider for surgery. Cardiac surgery does carry a much greater (approximately two to five times) risk in the elderly but, as with younger patients, the absolute risk is dependent upon the state of the myocardium, the extent of cardiac disease and the condition of other organ systems. Age is no bar to effective treatment of heart disease. There are a few cardiac conditions that are largely confined to the elderly. MITRAL ANNULUS CALCIFICATION occurs predominantly in old women. It is diagnosed from the chest Xray and it is not usually responsible for any symptoms. ENDOCARDITIS. A non-infective form of endocarditis may occur in the elderly. It is a hypercoagulable state that presents with cachexia, thrombosis and embolization. Anticoagulation may be needed. LEV’S DISEASE. Disruption of His-Purkinje conduction by fibrosis and calcification is most common in the old when it is known as Lev’s disease. 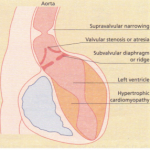 It presents with Stokes-Adams attacks and must be treated by pacemaker insertion. ATRIAL FIBRILLATION is much more common in the old but it is often well tolerated and may not need any active treatment for control of heart rate. Anticoagulation should be considered.